Happy 2015! I hope you had a fabulous holiday. We had a very low key and relaxing two weeks here at home, which I’ll be sharing more about very soon. I also have a few other posts in the pipeline that I’m excited about, including a few recipes (finally!) and life/baby-related things. You can expect to see more lifestyle posts in 2015 on A Balanced Life Cooks as life gets a bit fuller around here : ) I hope you enjoy reading them as much as I love writing them. Many women describe the second trimester as the “honeymoon trimester” and I’d say, overall, that was my experience. 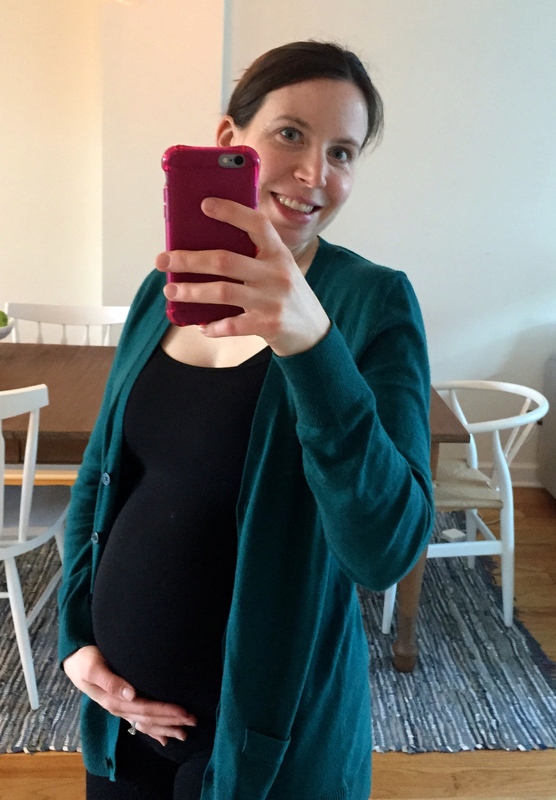 Soon after the 14-week mark my nausea subsided along with that crazy fatigue (I still experience both every five to 10 days on what I call “first trimester days,” but it’s more bearable than it was before). Mostly, though, my energy in the second trimester was kind of freakish. I think I drove Robert crazy at times because we’d plan to do something relaxing like watch a movie, but then I couldn’t sit still. I had to be up doing something like walking the dogs, cooking or baking, folding laundry, tidying–whatever I could come up with that kept me moving. I wouldn’t say I was in nesting mode quite yet unless I’m just always in nesting mode, homebody that I am. For the most part, I felt like myself throughout the second trimester, except with a growing belly. I absolutely love it and the little life growing inside. At the same time, I have to admit, there’s been a bit of a mental adjustment that’s had to happen when it comes to accepting this bigger, rounder version of myself (especially lately). I think many women secretly hope they’ll be the type to stay exactly the same, but with a basketball-sized bump on their belly. That’s not the case for everyone and I don’t think that’s been the case for me. I’ve tried to approach the whole body-changing thing with a sense of acceptance and gratitude. As long as I feed myself nourishing foods (with occasional splurges, of course) and move my body in ways that feel right (more on that in a moment), then I’m okay with whatever this body needs to do to grow a healthy baby that we’re so incredibly grateful for. Investing in a pair of Paige maternity jeans has been the best decision clothing-wise. I also bought a few sweaters from Gap and Old Navy maternity, all on sale. And I’ve purchased two dresses from the brand Seraphine, which I’ve already worn a few times to weddings and other events. 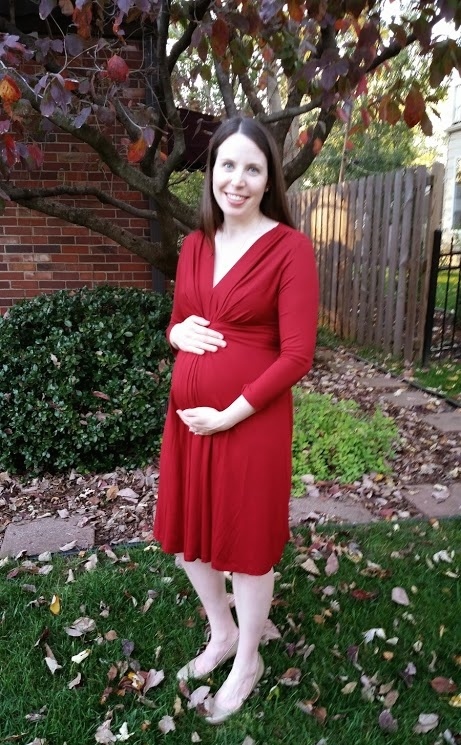 Once my pre-pregnancy clothes stopped fitting by around 20 weeks, I packed most of them away. There’s no point looking at them or trying to make them work if they just don’t. 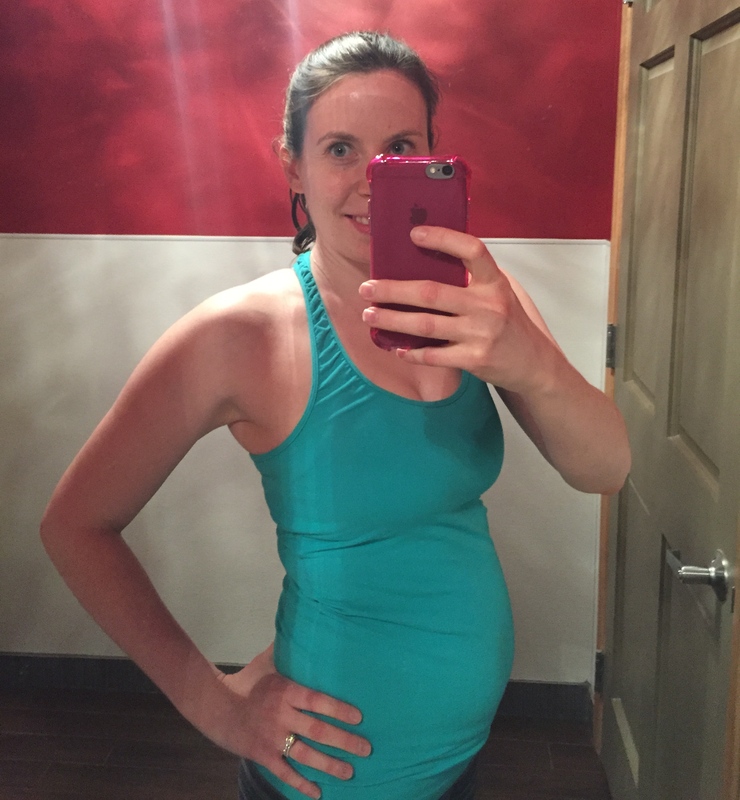 In terms of exercise, I was finally able to do a lot more in my second trimester. I took it very easy in my first trimester in part due to the nausea and fatigue, but mostly because I was afraid of doing anything that could hurt the baby (even though I know how important exercise is for a healthy pregnancy…) By 17 weeks I summoned the courage to take my first prenatal yoga class, which was also my first yoga class of any kind in months. And I discovered that prenatal yoga is kind of the BEST THING EVER. It made me feel like myself again since yoga is such a big part of who I am. It also makes me feel better overall because it helps open areas that are tight and achy such as the hips, shoulders, and low back. I take prenatal yoga classes twice a week and, bonus, the studios are within walking distance of our home (so no excuses!) I wish I hadn’t waited so long to go and next time around (if we’re lucky enough) I plan to start prenatal classes in the first trimester. I also try to walk a 3 to 5-mile loop with Remy most days of the week as long as the weather cooperates and that always feels great. Sleep For the most part, sleep has been good and restful. However, a few nights per week I experience what I describe as “running out of sleep.” I’ll wake up between 3 to 5 a.m. for absolutely no reason and can’t fall back asleep. Preparing me for what’s ahead? Perhaps. If you ever see my #firstbreakfast posts on Instagram, this is why. Once I’ve been lying awake for a while I start to get really hungry, which makes it even more difficult to fall back asleep so I get up and have something to eat. Appetite I noticed that I have lower tolerance for hunger so when I get hungry I have to eat rightthisverysecond. I eat about one extra snack per day beyond what I ate before becoming pregnant or make some of my meals just a little bigger. Also, uh, digestion got a little rough around the 19 to 21-week mark and things were not moving. That was no fun at all. I’m thankful for a family that loves potty humor and always responded to my complaining texts with hilarious and appropriate emojis. Cravings/aversions. I experienced phases throughout the second trimester where I loved and ate several different foods repeatedly until I pretty much got sick of them. Among them were: Sabra pine nut hummus with veggies, salty snacks such as cheddar rockets (Trader Joe’s version of cheddar goldfish, but better), chicken noodle soup, panini with fig jam, and citrus everything–orange juice, lemonade, oranges, and clementines. Oddly, I stopped liking Greek yogurt in the second trimester so that was kind of strange. I haven’t been a big fan of fish throughout my pregnancy, but I still try to down salmon once a week and take fish oil supplements. 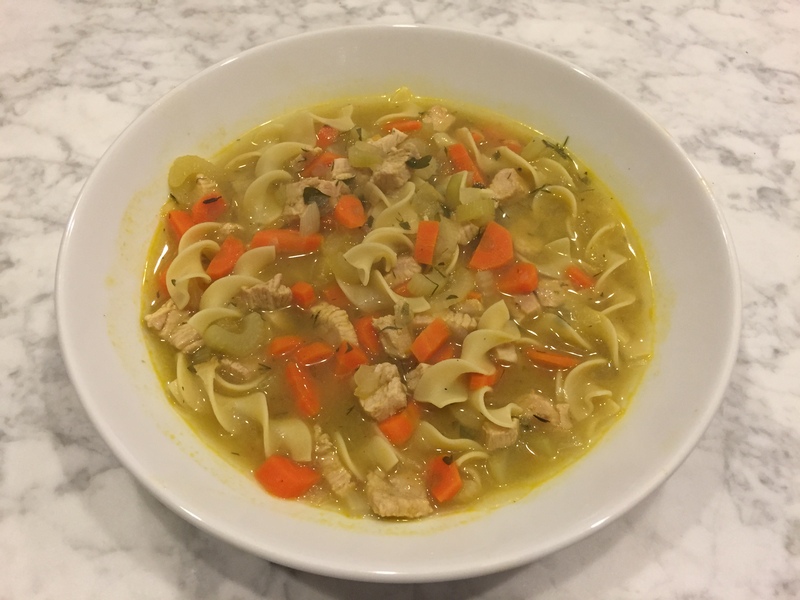 So much homemade chicken noodle! Healthy results at our 20-week anatomy scan! Finding out that we’re having a BOY! My family’s visit in November! Baby showers in Kansas City this weekend and Chicago in February!!! Getting a stroller. Would it be weird if I practiced walking around the block with the stroller and the dogs? I kind of can’t wait for that. Making LOTS of freezer meals. Over the holiday we bought a freezer for our garage and joined Costco. I also made a freezer meal Pinterest board that I will add to over the next few weeks. If you have any recommendations please let me know. It’s harder to find healthy freezer meals than I thought, but I’m up for the challenge and will keep you updated on that. 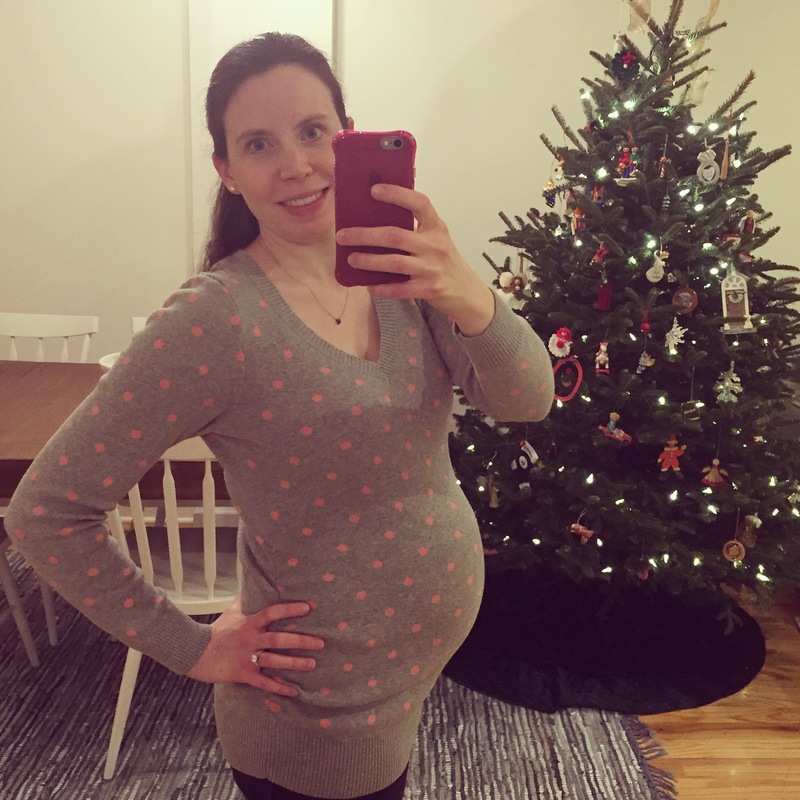 This entry was posted in Life, Pregnancy & Baby on January 5, 2015 by Paige Greenfield. What a cute bump!! It’s great to hear that you’re feeling good! 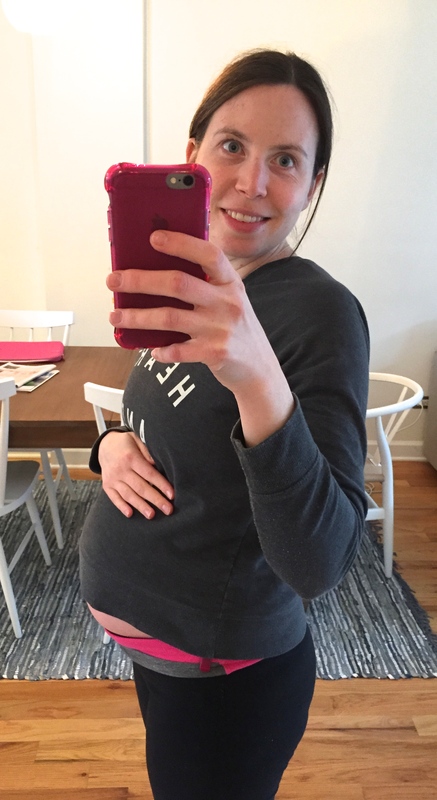 I hope it continues 🙂 I am going to recommend getting that nursery done ASAP – not because you *might* start to feel tired toward the end if sleeping gets hard, but because your belly is going to get too big to be able to move around and decorate like you might want to! I know what you mean about body changes, that was hard for me too. I decided to only buy maternity clothes that came in sizes S, M, L instead of numbered sizes to lessen the blow of gaining so much weight lol. For frozen meals, we love making various kinds of (vegetarian) chili in the crock pot and freezing them. We eat chili with rice & cheese so it hits all the food groups. Very easy to portion before freezing and then just microwave. Trader Joe’s also has amazing frozen foods (as I am sure you know). I also had the middle of the night starving feelings & I found that a drinkable yogurt or a banana worked well enough that I could fall back to sleep. Even with breastfeeding now I am sometimes very hungry at night. It takes a lot of calories to grow a human. I think it’s actually helpful for your dog(s) if you take walks with the stroller before the baby comes so they can get used to it, so go nuts! Nevette! Thank you SO much for this!! I recently stocked my bedside table with some wholesome granola bars so now I don’t need to get out of bed when hunger strikes : ) And sometimes I remember to bring a banana up there too just in case. I always love and welcome your input. You’ll likely be hearing from me when baby is here with questions, but please always feel free to offer it up! I can’t wait for those walks with the stroller : ) Hope you’re staying warm! !